Srividya Iyer-Biswas, Physics, Purdue Univ. Objectives: Microbial systems provide a unique setting for probing biological dynamics at multiple scales (sub-cellular, cellular and population levels). 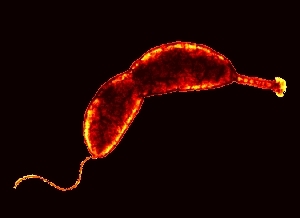 The free-living aquatic bacterium Caulobacter crescentus is a model organism for studying the cell cycle; it exhibits a dimorphic cell division cycle. Each division results in two morphologically distinct cells: a sessile stalked cell and a motile swarmer cell. The stalked cell remains anchored to a substrate and, provided there are sufficient local nutrients, continues to grow, replicate its DNA and produce new daughter cells. The swarmer cell swims off to find a new location of its own, where it differentiates into a stalked cell and completes the life cycle. Over the last decade, outstanding experimental advances have enabled molecular biologists to gather detailed data on spatiotemporal protein-localization dynamics of key proteins governing the cell cycle of C. crescentus. More recently, the development of a versatile quantitative live single-cell imaging system allows observing cell shape dynamics and protein localization dynamics in individual C. crescentus cells for hundreds of generations, thus providing high quality data both at the molecular and single-cell level. More conventional methods, such as flow cytometry and population growth studies allow quantification at the population levels. It is thus timely to now combine the wealth of available data at the molecular, single-cell and population levels, to build a multiscale, highly constrained, predictive model of the cell cycle of C. crescentus. Additionally this integrative model must also captures the inherent stochasticity of the underlying processes, and thus the resultant stochasticity in cell-division times for this model organism. This working group brings together active researchers working on various aspects of C. crescentus cell-cycle dynamics, including experimentalists, modelers and theorists, to discuss recent progress in this field, accelerate collaboration among them, and to produce an integrative model in the end. The working group consists of active researchers, including six biologists, and eight others from mathematics, physics, chemistry, computer science, and bioengineering. Meeting 1 participants (L to R): Hye-Won Kang, Shari Wiley, Kartik Subramanian, John Tyson, Yang Cao, Sean Crosson, Aretha Fiebig, Srividya Iyer-Biswas, Avrama Kim Blackwell. NIMBioS Working Groups are chosen to focus on major scientific questions at the interface between biology and mathematics. 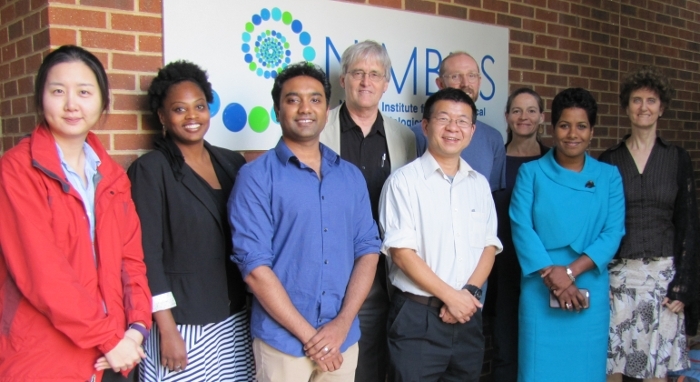 NIMBioS is particularly interested in questions that integrate diverse fields, require synthesis at multiple scales, and/or make use of or require development of new mathematical/computational approaches. NIMBioS Working Groups are relatively small (up to 10 participants), focus on a well-defined topic, and have well-defined goals and metrics of success. Working Groups will meet up to 3 times over a two-year period, with each meeting lasting up to 2.5 days.